Two-seat electric Toyota i-Road revealed | What Car? Toyota has shown the first teaser image of a two-seater electric concept vehicle that could become a rival to the Renault Twizy. The Toyota i-Road is set to be revealed at the Geneva motor show this March. However, Toyota says that it would expect any production version to be used in a similar manner to the bicycles that are available for public hire in major cities. It is expected to be smaller than the Twizy. A spokesman said that the concept car is designed to be like the Boris Bike, but in a car form. The idea is that the i-Road could be used as a short-distance hire car around the city, rather than as a privately owned vehicle. 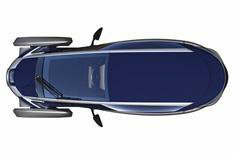 The spokesman said that there are currently no concrete plans to put the i-Road into production, but the company continues to view electric as a good short-distance engine option, so it has not been ruled out.